A reviewer of a subject tends to be convinced that everyone is familiar with the interesting and relevant aspects of his topic. The attitude I have taken is that any really good story can withstand any amount of retelling. 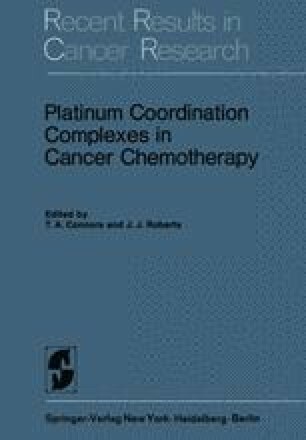 The discovery of the antitumour platinum compounds is just such a story and remains many years after it was first announced as one of the classical examples of serendipity operating in science. Who could have foretold that the modest opening sentence of the first paper which related to these compounds () and reads: “In an investigation of the possible effects of an electric field on growth processes we have discovered a new and interesting effect” would have been followed by so many other valuable discoveries and result in the innovation into cancer chemotherapy of an entirely new class of chemical agent. In this survey of the bacterial, viral and tissue culture effects of platinum compounds I will begin by briefly describing some of the elegant series of experiments by Rosenberg et al. , then mention other relevant studies in the bacterial field, before proceeding to discuss more recent viral and tissue culture studies.